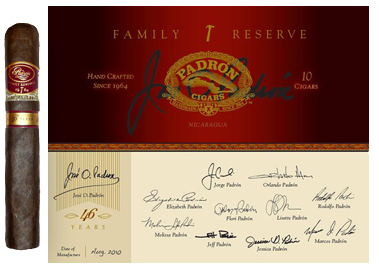 Known for making cigars of the highest quality, Padrón’s Family Reserve No. 45 Maduro scored a 95 point rating in Cigar Aficionado and was named the 2009 Cigar of the Year. Regardless of your thoughts on Cigar Aficionado and their rating system, a number one ranking is hard to overlook. Padrón is no stranger to the Top 25 list, as their Serie 1926 80 Years Maduro was the #2 cigar of 2008, behind only the Casa Magna Colorado robusto, while they took home first place honors in 2007 with their Serie 1926 No. 9. As has been mentioned in earlier reviews, sometimes a cigar carries so much weight with it because of the success of its predecessors, it’s almost impossible to give it a fair review. The bar is already set so high, that if it doesn’t perform up to some level of expectation, it gets knocked more than it should. Will that be the case with the new Padrón Family Reserve No. 46? To find out, the maduro and the natural go head-to-head in this review to see which – if either – lives up to the expectations of the Padrón name. A box of each was picked from the shelves of a local cigar retailer, and the cigars were given a chance to rest a few days before being fired up. A pair of both the natural and maduro versions were selected and smoked for this review from those boxes. Each is a corona gorda vitola, measuring 5 1/2″ long with a 56 ring gauge. As you will see in the pictures, it has almost a square shape, having been trunk-pressed using some of Padrón’s oldest tobaccos. They are made in Esteli, Nicaragua, at Padrón’s Tabacos Cubanica factory, and have a suggested retail price of $25 per cigar, before local taxes are added. Just looking at the cigar and thinking of its predecessor, it’s hard not to think this will taste like absolute heaven. The first cigar has a a sweet, milk chocolatey aroma prior to lighting, with a rich, deep aroma that seems like it should be found in a candle shop. The second’s pre-light aromas are milder, with not much to pick out without feeling like fishing for a certain scent, although notes of black cherry kept popping up. Given that a glass of Pinot Noir was being enjoyed at the time, though, that may have been the wine forcing itself into the review. Both cigars were firm with a box press, the first one just slightly less than the second. The cold draw on each was impeccable, with both showing a bit of spice while the first had a touch more of a tobacco taste and the second presented some buttery notes. Right after the light, the draw seemed to really open up and deliver plenty of smoke, but the draw suddenly seemed to be almost too loose. Flavors on both seemed a bit dry, and didn’t seem to align with what was present on the aroma and cold draw. If anything, it lacked a bit of complexity. What held the maduro version back was its technical performance. The ash flowered a bit at the beginning, with small pieces chipping off within the first 1/4″. It remained flaky throughout the cigar, and while there must be a certain level of tolerance for this, the Padrón Family Reserve No. 46 certainly tested one’s patience with having to dust off the keyboard, table and shirt from ash flakes. Both of the cigars smoked were very good looking with no appearance flaws, though both were on the firm side. Both presented some notes of toffee on the pre-light aroma, while the cold draw was fine on one and just a bit too loose on the other. The natural wrapper version proved to be incredibly mellow and mild to medium bodied. 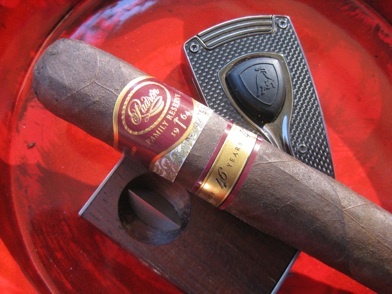 There are hints of nuttiness that are fairly consistent throughout the cigar, but nothing that becomes overpowering. The smoke is perfectly smooth and doesn’t impose the least bit of harshness.